I'm cheap......yep if you didn't know it already, I'm cheap!! In this last post featuring Curly Chellez, a commenter on the blog mentioned that Magic Leverag is a cheap alternative to curl formers. As I said before, I have a problem with the price tag of curlformers. I see them as plastic rollers and seriously, I cannot see myself forking out 50 bucks for them. Magic Leverag curlers appear to be the Chinese 'knock off' of curlformers and retail for 1 buck........yes you saw that figure correctly........$1 / £1. They are available on ebay and after adding posting from China, I still only paid about 5 bucks for two packs! It did take forever to come but the seller does say this anyway (14 days from Hong Kong to UK). However, I was ready to gamble $5 rather than $50 and to be honest I am very happy with them. Each set has 9 short rollers and 9 long rollers. 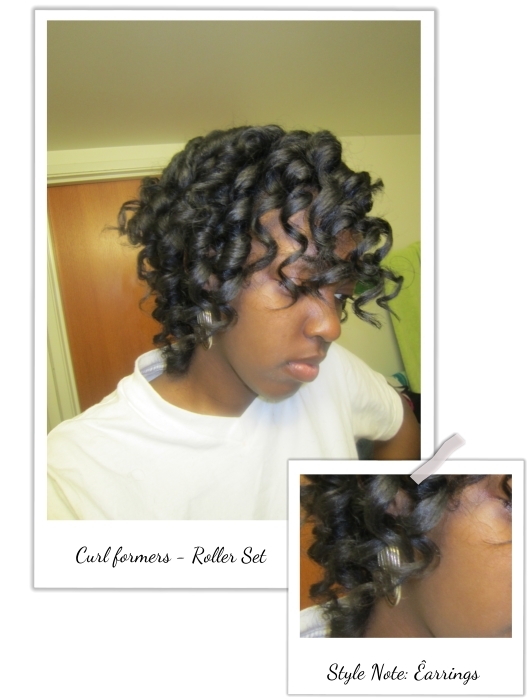 The long rollers are not that long - my hair is about 12 inches long and about 1-1.5 inches hangs outside the roller. I ended up twisting the root and then using the roller on the rest. The short rollers (I did not use them) are much shorter - I would estimate that they are suitable for hair that is not longer than 6 inches. The wand that comes with it is a little tricky to use but once you get the hang of it, it works. I tend to like very smooth nice edges but for 1 buck, I really cannot complain much. I have not done a proper style yet as it is swimming season and I am in braids, I just undid two braids to play with. In short, they are perfect for shorter hair, if you are also looking for a heat free way to stretch your hair, they work too. So there you go, something cheaper for you! Thanks of course to the commenter who mentioned it! I would like to point out that the hair curling product called Magic Leverag, which you described quite correctly in your blog last week, as "a knock off", is also an illegal, counterfeit product, which infringes Hair Flair Ltd's UK and European, USA and China patents for our product Curlformers. You also pointed out that the lengths of the 2 sizes of 9 curlers (only), in the Magic Leverag presentation, are of strictly limited practical use for women with hair more than 10" (22.5cm) long! For the information of your price-concious followers, (and who cannot afford to be these days! ), Curlformers are available in 3 lengths and 3 widths and cater for hair from 6"(15cm) to 22"(55cm) long, either in Starter Packs of 10, 8, 6 or 4 Curlformers, depending on the length and/or width, or in "full head" Styling Kits of 40 pcs, and 2 hooks. 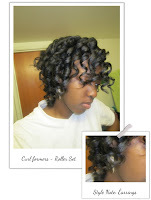 Of the 40 Curlformers in a Styling Kit, 20 create clockwise curls and 20, anti-clockwise curls, (24 pcs, (12 + 12) in the Extra Wide & Long Styling Kit). The Styling Kits all come with and are presented in practical PVC Holdalls. The prices in any of 3 currencies, (£, $ and €) are available on our web site. Curlformers are extremely long-lasting and any investment made in them will be recovered from the savings made from two visits to a salon. Curlformers deliveries within the UK are normally made within 3-5 working days, whilst international deliveries, (depending on the destination), can take up to 2 weeks. Congratulations on producing probably the most helpful and informative hair blog for afro-caribbean women I have ever come across! Thanks JC, I've been oogling over curlformers for a while but the price had never sat right with me. I am getting me a set of Chinese knock offs asap!! Lol! wow this is awesome!! finally I can get the same results without paying $57. Off to get me some Magic leverag! Thanks Jc for posting this! The Magic Leverag is a better choice for me too! I am a frugal person! I looked at US sites (Amazon and Sally's) and found they're selling what appears to be replacement packs for CurlFormers. I'll check out my local Sally's to see if they have the wand and extra long and wide packs. If not, I'll order them from Sally's website. Even if I have to use 3 packs of curlers, the price still comes out cheaper (including wand price) than the CurlFormers package. Yay thank you JC for spreading the new about magic levrag and thanking me in your post. I'm glad you tried them! I love mine and they are AMAZING for transitioning hair, as it blends in both without heat. Curlformers are SO expensive and I hope that as the knock off's get more populoar they will adjust their RIDICULOUS prices. wow, I wish I would have known about these before spending over $80! thanks for the tip! i hate how companies will say "don't buy that knockoff, buy our MORE EXPENSIVE *original*. um, yeah right.